Not too much progress yet, but I got all of my purple fabric cut out (okay, all but one, due to an apparent miscounting incident). Now I need to acquire some Kona White since I don't have enough in the stash for the entire quilt. I decided for my 30 minutes of selfish sewing a day this month I would pick up where I left off on my Swoon quilt. We're just a couple days in, but I've organized all my pieces of my two in progress blocks. I did a bunch of pressing and a little bit of sewing, and I have the pile all ready to go for today's sewing. 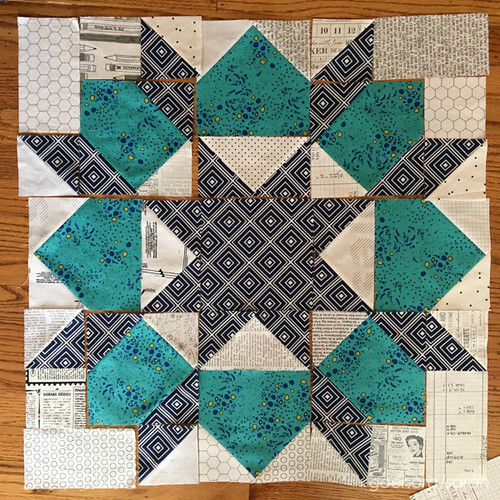 Here's a peek at how these blocks are shaping up. I kind of love them! Just 28 more seams per block and they'll be done. 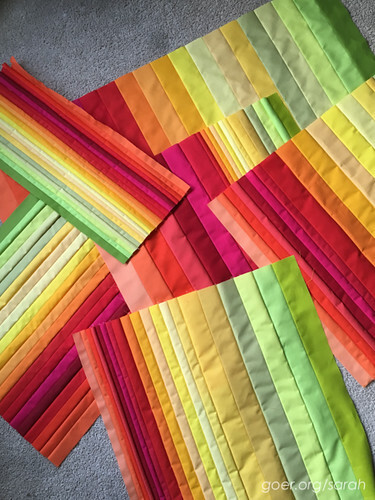 No photos, but I cut out a ton of 3 1/2" squares of fabric in preparation for teaching 20 kindergarteners how to hand piece 4-patch quilt blocks starting tomorrow. The kids have decorated a white square and they will choose three colored fabrics to complete their 4-patch. I'll put them all together and finish the quilt. I'm working with two groups, so there will be two finished quilts. I decided to go with warm colors for one and cool colors for the other... and oh boy was it hard to come up with warm color scraps. I have a clear preference for cool colors. My son and I participated in 52 Quilters in August. We are sorely behind on making our blocks. We have, however, finally decided what blocks we're making. 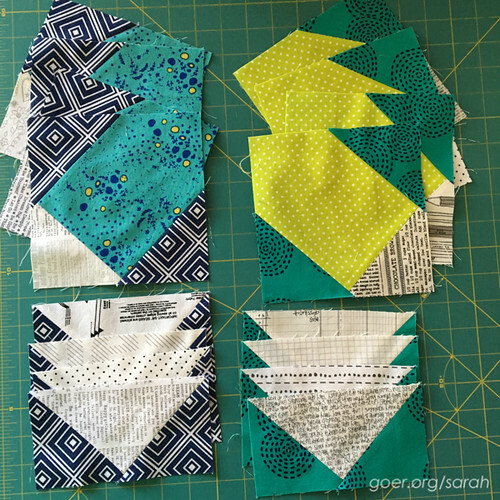 G is going to make a Preppy the Whale block and I'm going to make a rainbow 1/4 Dresden block. Here are our fabric pulls. 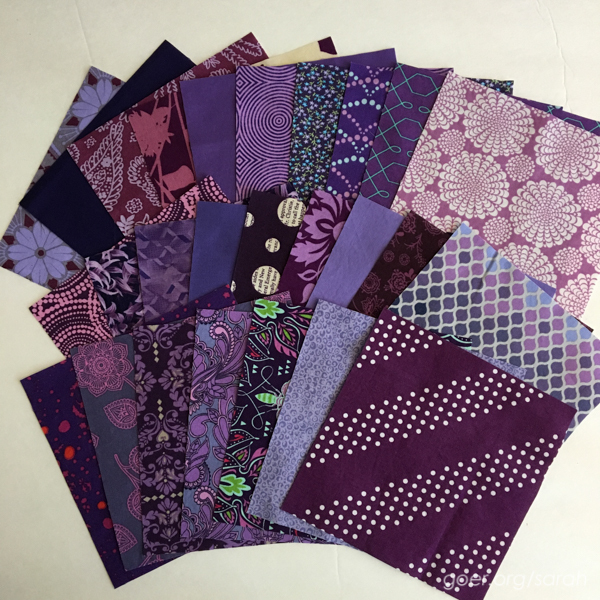 Before I jumped into my February sewing I got as far as finishing the piecing all my stratas for my Color Strata quilt. Lots of seams to press, but it's been set aside for the moment in favor of the above projects. 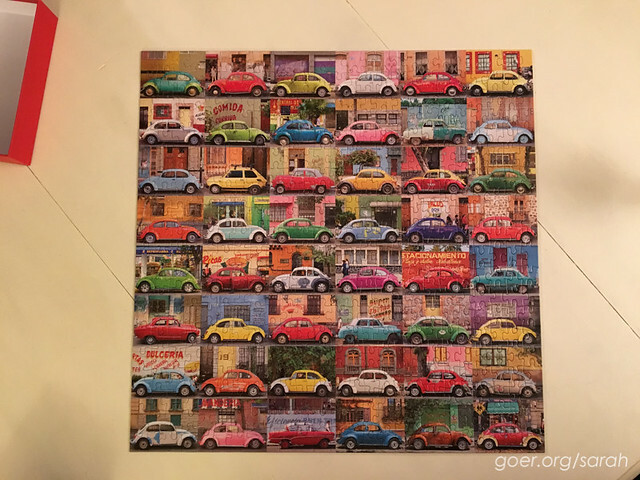 Oh, and I enjoyed a night out this week with friends for puzzle night. I love the colors in this one! You can check out my "Sarah's Cooking Show" video on Katch, where I show how to make one of our favorite crock pot meals. I love throwing food in the crock pot in the morning so that I don't have to interrupt my sewing to prep dinner in the evening. Phew, that all makes me kind of tired. Thanks for visiting! 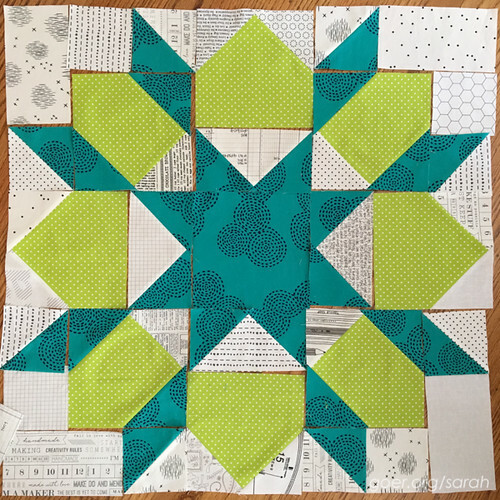 Posted in Quilting on February 3, 2016 by sarah. Sometimes recapping a lot of work and effort is more exhausting than living it. 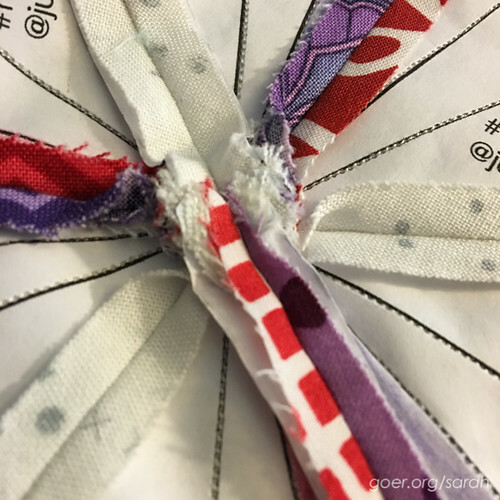 Your seam with 18 fabrics coming together looks great; it is really difficult to deal with that much bulk and it looks like you nailed that one. You've been very busy! 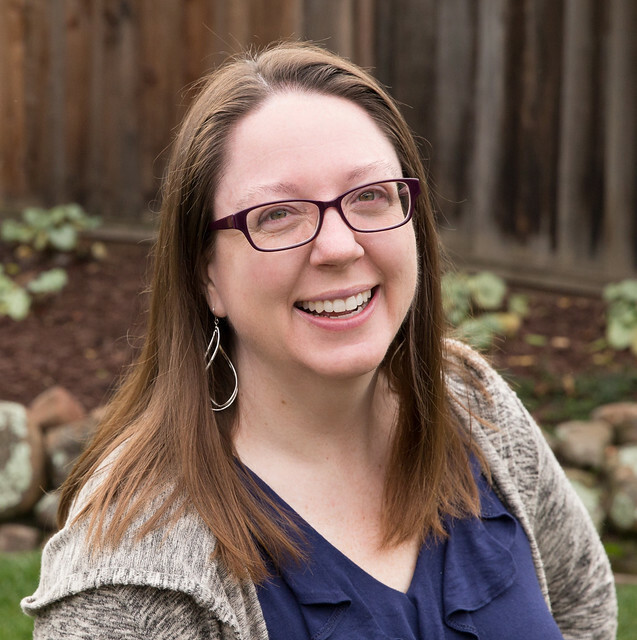 Can't wait to see the front of your Rainbow Swap mini (18 seams--eeek!) The strata look fantastic--and will look even more awesome once you add your pop color. And please let us know how the hand quilting class lesson goes!! Thanks, Mel. I've started all 20 kindergarteners on their sewing projects. Most are doing great. They all started this week and I some are on the final seam of their 4-patch block. I'll try to get some pictures of their work next time I'm in the class.